Realising his speech in January did not go down too well in EU capitals, David Cameron is this week embarking on a charm offensive across Europe. He’s visiting Madrid, Paris and Berlin, among others, basically trying to sell to others his call for repatriation of powers, oops, no, sorry, that word can only be used in the UK. When delivering that message elsewhere there “should be a discussion across Europe about how we make the EU more flexible, and how we make clear that powers can flow back to nation states as well as flow forward to the EU”. But this very phrase – whether to use the term repatriation or not – precisely shows Cameron’s problem. He is trying to play to an EU-sceptic public and particularly his backbenchers at home, while trying to sound conciliatory when in other EU capitals. It is a balancing act that does not work. Prior to his departure, Cameron has been giving interviews to Le Monde and Süddeutsche, among others. The Le Monde interview is here, Süddeutsche (short version) here. “Wir sind immens positiv für Europa” he says in SZ, translated as “We are immensely positive about Europe”. Could you imagine him saying that to a UK audience? Of course all this comes after France and Germany refused to participate in the UK’s competence review, so it is going to be a rocky road for him. The Times and The Telegraph, together with the centre-right commentariat in the UK will follow his every move, trying to determine if the body language between him and Merkel at a press conference is positive or not, or whether Germany seems to be open to Cameron’s calls for reforms or not. And at the end of the week we will probably all be none the wiser. But there remains an essential problem. Cameron seems to see the European Union as an amalgam of national interests, an intergovernmental union, a zero-sum game. Leaders in other EU Member States do not only see it that way. There remains the notion (false some might argue, but a notion nevertheless) that the European Union can itself achieve some degree of democratic legitimacy, something that Cameron implicitly rules out. It is going to be an underwhelming week. 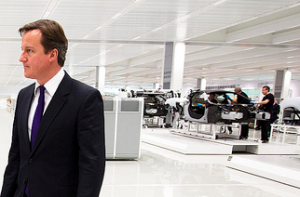 LabourList | Is there actually any substance to Cameron’s bluster? I see the UK leaving the EU as a result of the UK’s policy towards the eurozone. Decision-making in the EU is shifting towards the eurozone. As joining the euro is a political impossibility, the UK is left wielding a veto in the EU only. In practice this means a proposition is first tabled in the EU; the UK vetoes it, or kicks the ball in the long grass, which amounts to the same, and in the end the eurozone implements the proposition on its own. The UK veto pleases voters and businesses at home, while at the same time annoying not only eurozone members, but also those EU members who are outside the eurozone, as they feel left out. Poland is a prime example: a country which mentality-wise ought to be close to the UK which we unwittingly alienate. Under normal circumstances, Poland would be a UK ally. However, as Poland has a large number of factories from euro countries, Poland also needs close cooperation with the eurozone – and the UK’s policy effectively rules hinders Poland’s access to eurozone policymaking. We end up not making friends, and Poland will probably end up joining the euro sooner rather than later. There is, of course, an alternative. The UK having to live with an an alliance, a bloc, of 17 countries on its doorstep is unpleasant. But the UK is perfectly at ease if the euro breaks up and the EU is reduced to 27 loosely coordinated countries, with each country doing more or less it’s own thing. The logical conclusion seems to be that either the euro breaks up, or the UK leaves the EU. As I believe continental commitment to the euro to be stronger than UK commitment to the EU, I would guess the UK will withdraw from the EU in the foreseeable future. There’s always cosmetics, of course: instead of slamming the door behind you, you can call a referendum. The second European tour, the second aborted tour, for Cameron. Hardly convincing. @Adam – but why would they want too? Right from the 2009 decision to take the Tory MEPs out of the EPP in the European Parliament, Cameron has basically been pulling his party away from the mainstream. You get people into a conversation through continual dialogue, by meeting half way, by cooperating and collaborating rather than fighting. Cameron is now realising that he has paid too much attention to his backbenchers for too long, and needs allies, but this initiative this week (now aborted anyway due to Thatcher) is going to have to be just the start of a lot of engagement. I don’t think he will have the stomach for it. Would have been great if other countries (such as France and Germany) could make this into a two-sided conversation. i.e. – agree to some of his demands, but only in return for the UK backing other changes (such as a directly elected president, or closer collaboration in areas where it does make sense such as foreign relations and defence).